Microsoft has a labs site, just like every major software firm in the world. One of their latest additions is Pivot. Pivot is an interesting concept. If it takes off, it could help users browse large amounts of data very quickly. It uses a visual interface system that links groups of data on how they are related. These groups of data are called Collections. Each Collection groups, or links, large amounts of single items on the internet. It does this in a way that we can view them, either as individual bits of information, or as larger amounts. Microsoft says that Pivot will allow us to see hidden patterns in our data, and maybe even take us to places we didn't even think of. Could be. Whether or not Pivot will change the way we interface with the internet is too hard to tell at this moment. I do know that it will be fun to try. But what do you do with the data once you see it? How do I get the data out of Pivot and put it in the application I'm using? It is too early to tell where this product will go. it may never make it out of the labs. I will keep my eye on it. CAD-a-Blog has primarily been a blog about Tips and Tricks in AutoCAD. I have dabbled in Impression Tips, and have mentioned other design programs too. I have decided to move forward. I want to expand the horizons (and content) of CAD-a-Blog. I have started down a journey to learn new software. This will accomplish two main objectives: I will learn new skills, and I will expand the content of CAD-a-Blog. The plan is to get my hands on a good training or reference manual and go through it, As I teach myself to use Inventor, I will blog about it. As I learn, my readers can learn. As I have questions, I will ask them and you can respond. Your input will help me along this journey. I am very excited to get started. First I will have to install this beast! The case has seven DVDs in it. That's because it is the Professional Suite. Not only does it come with Inventor, but it also had AutoCAD Mechanical. Should I start there and work my way to Inventor later? I'm not sure yet. I want to learn both and I feel that Inventor will be the biggest challenge. Have you used either program? How do you use it? How was your switch from CAD to Inventor? How does it compare with other software? (FYI: This is not the only new software I'm trying to learn.) Should I install Vault? Are you using Inventor LT? If so, why LT and not "regular" Inventor? If you have written a book that teaches Inventor and/or AutoCAD Mechanical 2011 let me know. I am interested in seeing it. About a month or two ago I reworked the branding a bit for CAD-a-Blog. I developed a new logo (never really had an old one) and started using a new template for my blog. I even started posting again after a long time of neglect. I soon noticed that my traffic was cut in half? WHAT? Where my posts that bad? Probably so. After further investigation I realized it wasn't my feed traffic that was reduced; it was my search engine traffic. Hmmm. After even further investigation I realized that I no longer had any keywords in my meta data. In fact, I had almost no meta data at all! YIKES! I fixed that. Now let's see if people can find me again. I hope so. Cadalyst Magazine Editor in Che if, Nancy Spurling Johnson takes a look at Autodesk's recently released 2011 line of products and what it could mean for the design industry. Nancy takes a look at some of the items revealed to her at AEC Tech Day. Take a look at the article, you may find something in it for your industry. AutoCAD is an industry standard design and documentation software program that is easy to learn, but complex to master. In this video training CD, expert author Brian Benton takes you through the fundamentals of AutoCAD and gives you the tools you need to be on your way to becoming a fully functioning AutoCAD user. Starting with the basics of installation, Brian quickly teaches you the basics, and then dives right into applying them, with a chapter project that reviews everything you have learned in each section. Using a hands on approach, Brian allows you to more quickly learn how to apply the material, increasing your retention and understanding of AutoCAD. 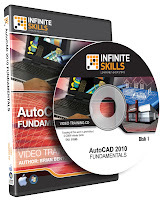 By the completion of this over 9.5 hour tutorial, you will be familiar and comfortable with AutoCAD, and capable of drawing, decorating and annotating an AutoCAD project. Also included are work files to allow you to work along side the author, and further understand what he is showing you, step by step. I have a busy weekend. Lots of work to do. I am "redoing" the first chapter of my training video "Autodesk Fundamentals" to include some AutoCAD 2011 features. I am also working on my next training video outline "Advanced AutoCAD". We are still working on the title. Any suggestions? Download this helpful guide for using AutoCAD 2011! You will have to have a membership in AutoCAD Exchange to get it, but it's free to join!